Welcome to the monthly e-bulletin of the South Asia Media Solidarity Network (SAMSN). The next bulletin will be published on October 17, 2016, and your inputs are most welcome. The IFJ marked the International Day of the Victims of Enforced Disappearances on August 30 calling on Asia-Pacific governments incriminated by enforced disappearances of media workers to take active steps to investigate critical cases and tackle impunity around missing media workers in the region. 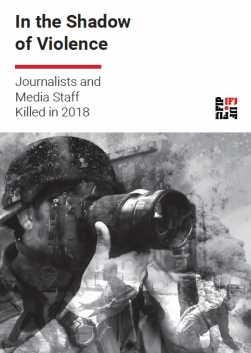 The IFJ notes with serious concern that little progress has been made in the investigations of 11 documented cases in the Asia-Pacific since it released its first report on missing Asia-Pacific media workers in 2015. Since then, an additional case has been added to the list – that of 24-year-old Pakistani journalist Zeenat Shahzadi, who went missing on August 19, 2015. The IFJ’s monitoring record Without A Trace: Media Workers Missing in the Asia-Pacific lists the media workers from five countries in the region whose cases remain cold, where investigations have either faltered or failed to adequately determine the circumstances or perpetrators. Collectively, the 11 media workers have been missing for a total of over 46,000 days. Across the region, the missing include, Juanta Nielsen (Australia), Prakash Singh Thakuri, Chitra Narayan Shrestha, Milan Nepali, Madan Paudel (all of Nepal), Ahmed Rilwan Abdulla (Maldives), Zeenat Shahzadi (Pakistan), Joey Estriber (Philippines), and Prageeth Eknaligoda, Subramaniam Ramachandran and Vadivel Nimalarajah (all of Sri Lanka). More here. A five-member Appellate Division bench led by Chief Justice Surendra Kumar Sinha, on August 31 granted three months bail to 81-year-old journalist Shafik Rehman who was arrested on April 16. Rehman was arrested for attempting to abduct and murder Prime Minister Sheikh Hasina’s son Sajeeb Wazed Joy in the USA, yet to date, no charges have been laid against him. Rehman has been in detention since his arrest, including the prison hospital after his health deteriorated. He had previously been denied bail by the High Court, and according to his family was placed in solidarity confinement in prison. On August 16, the IFJ, Reprieve, Index of Censorship, Reporters Without Borders and 21 other international press freedom organisations had written a joint letter demanding the immediate release of Rehman. More here. Meanwhile, the High Court on September 7 also granted bail to daily Amar Desh Editor Mahmudur Rahman in a case of an alleged attempt to abduct and murder PM’s son. Mahmudur Rahman, a pro-opposition party journalist, has been behind bars since April 11, 2013. He was arrested in several cases, and has got bail in all of them. More here. Journalist Kishore Dave was murdered in Junagadh, Gujarat on August 22. Dave, the Bureau Chief of Jai Hind, a local daily in Junagadh, was killed in his office by unidentified assailants in the evening. As he was filing a report, Dave was attacked and stabbed multiple times in the chest. He was alone at the time of the murder and was found later by an office assistant. The police has arrested three people in connection with the murder. Read more. On August 24, the Southasia Trust, the publisher of the cross-border magazine Himal Southasian, announced that the November 2016 edition would be the last issue published. The Trust cited the non-cooperation of regulatory bodies as the reason behind the decision, noting that the regulatory bodies ‘have made it impossible to continue operations after 29 years of publication’. The Trust said that ‘Himal is being silenced not by direct attack or overt censorship but the use of the arms of bureaucracy to paralyze its functioning’. More here. Journalists and photojournalists in Kashmir, India are being subjected to attacks and harassment on a daily basis since the unrest began on July 8. 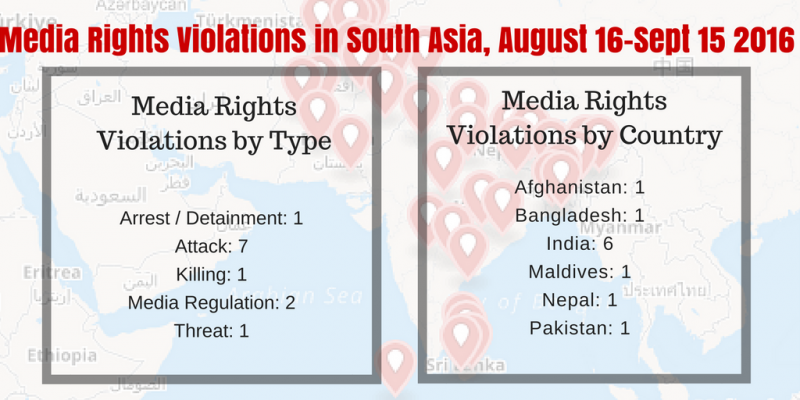 At least four major incidents of press freedom violation were reported in first week of September. On September 3, two photojournalists Muzamil Mattoo of the Kashmir Reader and Zuhaib Maqbool of an online news portal, were injured by the pellets fired by the security forces on a procession at Rainawari, Old Srinagar. Matoo sustained pellet injuries in head, back and arm, while Maqbool was hit in the eye and needed surgery. A day earlier on September 2, the Jammu Kashmir Armed Police force thrashed at least half-a-dozen photojournalists at Batamaloo in Srinagar while they were on duty. Mubashir Khan (Greater Kashmir), Aman Farooq (Greater Kashmir), Faisal Khan (Kashmir Reader), Shah Jahangir (CNS), Omar Asif (KNS), and Bilal Bahadur (Kashmir Life) were assaulted and thrashed by government forces. Similarly, on September 1, TV journalist Ishfaq Gowhar of J-K Media Network Group, a leading cable TV provider, was first stopped by protesters near Naaz Crossing in Srinagar and after convincing them when he moved ahead the Central Reserve Police Force men deployed there attacked his vehicle (JK0AB/0733) and damaged it. Earlier, Danish Bin Nabi of the Rising Kashmir was thrashed by protestors at the SMHS hospital where he went to report on the victims of police firing. In the evening of August 17, Sumaiya Yousuf, 25, a reporter with Rising Kashmir said she was accosted by the police in Jawahar Nagar, Srinagar when she was buying vegetables on the way home after filing her story. Despite showing them her press identity card, she was abused and beaten. More here. Siddiqur Rahman, the editor of education specialist website DainikShiksha.com, was arrested on September 1 over a news item. Rahman was arrested after Prof. Fahima Khatun, wife of a ruling Awami League parliamentarian Obaidur Muktadir and a sister of Food Minister Kamrul Islam, filed a case under Section 57 of the ICT Act. Khatun, the former Director General of the Higher Secondary Education Directorate, claimed that a news claiming corruption during her tenure in the Directorate, ‘defamed and tarnished’ her image and that of the state. More here. The situation of press freedom in the Maldives has declined in last few months. On August 28, the Maldives National Chamber of Commerce and Industries (MNCCI) requested President Abdulla Yameen to implement restrictions on foreign journalists, on grounds that they were causing damage to the economy and the tourism sector. The MNCCI reportedly said ‘foreign journalists are biased in their coverage of the Maldives’. The call came in the wake of an announcement by the Department of Immigration which set new rules requiring background checks on foreign journalists and photographers visiting the Maldives. According to reports, foreign journalists and photographers arriving in country are now required to provide details of their work and travel histories and education, and information on their bank account and criminal records. The Maldives media have also been forced to self-censor after the new criminal defamation law was passed on August 9. The law criminalizes ‘defamatory’ speech, remarks, writings and actions and empowers the state authority to shut down media for its ‘defamatory’ contents. More here. Cadres of the Muttahida Qaumi Movement (MQM) political party attacked the ARY News TV station on August 22 in Karachi, Pakistan. Dozens of attackers armed with rods broke into the office and vandalized doors, windows, furniture and equipment and set fire to vehicles. According to news reports the violent storming of the station was carried out by MQM supporters after their leader Altaf Hussain, currently in exile in London, incited them to attack TV stations during a speech criticizing media for not adequately covering the week-long hunger strike against the government’s crackdown against MQM. The MQM cadres also attacked the media workers and vehicles who went to cover their hunger strike near the Karachi Press Club. Dunya News reporter Fahad Qamar was injured while reporting the scuffle between police and the protestors. Morehere. Deepak Chaurasia, the editor in chief of India News TV, was threatened over phone after his private number was shared by Delhi Tourism and Water Resources Minister Kapil in Twitter on September 13. Chaurasia lodged a First Information Report (FIR) at the Safdarjung Enclave Police Station against unidentified persons after receiving multiple threat calls and messages. Chaurasia alleged that he started receiving threat calls after Mishra shared his number in a tweet after the India News TV made public the numbers of AAP ministers listed in AAP website in a TV program. More here. 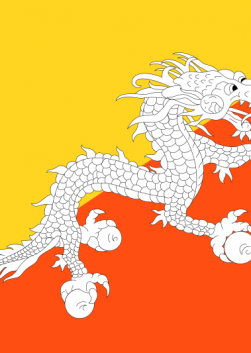 Since January 2016 regulatory bodies of the Nepal government have withheld permission to use grants we have been given and have not processed work permits we have applied for with no reason being given. Permission was neither given, nor denied and no timeline for a final decision was given… We struggled with a dwindling work force for several months and everyone worked long hours so that there was no negative impact on our core work, but eventually we had to announce our suspension since we will no longer be able to pay salaries to staff nor payments to contributors after November. Read more. Restrictions on media in different ways have been on since July 8, when the killing of Hizbul Mujahideen commander Burhan Wani fanned protests across the Kashmir Valley. Movement of media persons has been curtailed and smaller papers have almost ceased publication. The latest was when August 12 government blocked the internet services to major newspapers ahead of Pakistani and Indian Independence days. For three days Internet connectivity was disrupted, leading to disruption in newspaper publication. Read more. In the 27 cases of journalists murdered for their work in India since 1992, there have been no convictions. More than half of those killed reported regularly on corruption. The cases of Jagendra Singh, Umesh Rajput, and Akshay Singh, who died between 2011 and 2015, show how small-town journalists face greater risk in their reporting than those in larger cities, and how India’s culture of impunity is leaving the country’s press vulnerable to threats and attacks. Find the special report by the Committee to Protect Journalists here. “Whenever there is a volatile situation, people run away from it, but it is the photojournalists who run towards it to cover it for the world,” says Javed Dar, an award-winning photojournalist who has extensively covered the conflict in Kashmir for more than a decade. “Photojournalists working here are always at risk of being hit by bullets or teargas shells because they have to enter the heart of clashes between protestors and the forces to get a better angle for taking pictures.” Read more here. The Criminal Investigation Department (CID) of Sri Lanka has concluded the investigation into the disappearance of journalist Prageeth Eknaligoda and the final report is expected to be referred to the Attorney General (AG) within two weeks seeking indictment of the suspects. A CID source said that there was adequate evidence to file murder charges against the eight army intelligence officers, who have been remanded on allegations of abducting and killing Eknaligoda. Read morehere. The police raided the Maldives Independent office in Malé with a court warrant over an alleged coup plot, hours after Al Jazeera released a documentary about corruption in the country. The documentary features an interview with Zaheena Rasheed, the editor of the Maldives Independent. A search warrant alleged a conspiracy “to overthrow the elected government, getting external help to overthrow the elected government, trying to create hatred between the public and the state institutions, and planning to create discord and unrest in Malé.” Read morehere. The war in Afghanistan has long been a dangerous assignment for journalists, but groups say the country’s deteriorating security situation is making things more difficult, especially in areas held by the Taliban and Islamic State fighters where the government is struggling to regain control. The overall situation in the country is dire for everybody, but journalists are particularly affected. Read more here. In a recent study of media use and consumption in Afghanistan, the salon and madrassa were among limited spaces, even in urban areas, where women consumed information without interpretation or mediation from men. The information ecosystems research in Afghanistan was conducted under the USAID-funded Afghan Civic Engagement Program (ACEP) implemented by Internews and Counterpart International. Read more here. UNESCO has just published a report titled: Supporting Safety of Journalists in Nepal: An assessment based on UNESCO’s Journalist Safety Indicators (JSI). The report documents the national state of journalist’s safety and the issue of impunity by providing an overview of the safety situation of journalists in Nepal. It also points out the context of safety and the responsibility of all stakeholders in addressing the issue of journalists’ safety in the country. Read more here. Some women have stopped expressing themselves for fear of ‘inviting’ abuse. They’ve tied their tongues. Others hold back, or self-censor, again for fear of ‘inviting’ abuse. On the one hand, this is uncannily similar to women and girls not going out at night or not dressing how they please for fear of ‘inviting’ abuse or harassment. On the other, this is also about #FoE. Surely, freedom of expression cannot be defined to mean that only some get to speak – at the cost of others’ speech? Read more here. The Dart Center Ochberg Fellowship is a unique seminar program for veteran and mid-career journalists who wish to deepen their knowledge of emotional trauma and psychological injury, and improve reporting on violence, conflict and tragedy. Fellows attend an intensive weeklong program of seminars held at Columbia University in New York City. Program activities include briefings by prominent interdisciplinary experts in the trauma and mental health fields; conversations with journalist colleagues on issues of ethics, craft and practice, and a variety of other opportunities for intellectual engagement and peer learning. The Ochberg Fellowship covers roundtrip travel, lodging, meals and expenses directly related to participation. More informationhere. The International Women’s Media Foundation (IWMF) established the IWMF Emergency Fund in 2013 to provide women journalists with a lifeline of support in times of crisis. The Fund provides women journalists with small grants for psychological and medical care for incidents directly related to threats and crises caused by one’s work as a journalist; or three months of temporary relocation assistance in the event of crisis or threat; or legal aid to counter threats of imprisonment or censorship; or non-financial assistance in the form of information about additional access to resources. More information here. 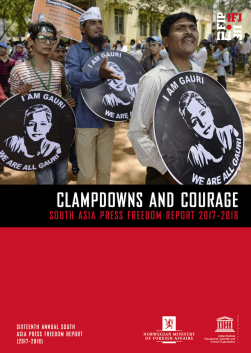 SAMSN is a group of journalists’ trade unions, press freedom organisations and journalists in South Asia that works to support freedom of expression and association in the region.